We have reserved a number of hotel rooms at five hotels for the conference attendees. These reservations are available now and early booking is recommended to ensure availability at these reduced prices. They are all within a 1-mile distance to the University’s landmark, Wills Memorial Building. – Please note that some of these rooms are available for double occupancy, so you can share with your colleague if you want. – Any enquiry and booking should be addressed directly to the hotels, not to us. Prices and conditions might be subject to changes made by hotels. 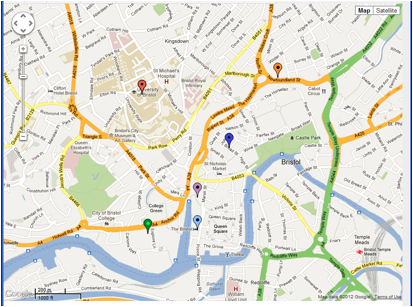 View Hotels for ECML/PKDD 2012 in a larger map. Prices, conditions, and booking procedures can be found by clicking on the hotels on the Google map. We have also reserved rooms one or 2 days before and after the conference. If you want to stay more days than these dates shown below, please contact hotels for availability and prices. Thistle: 22 Sept, 15 single rooms, £80/night. Bristol Hotel: 22 and 29 Sept, the same rates as those for 24-28 Sept.
Radisson: 22and 29 Sept, the same number of rooms and same rates as those for 23-28 Sept.
Ibis: 29 Sept, the same number of rooms and same rate as those for 23-28 Sept.
Holiday Inn: 21, 22 and 29 Sept, the same number of rooms and the same rates as those for 23-28 Sept. The above five hotels cannot accommodate all attendees. Following links offer useful information.